Grandma's Knitting Place: WE WON!!!!!!!!! YAAAAYYYYY!!!! Thank you so very much to all the countless thousands of people all over the world who voted for us!!!! Here is the Press Release put out by Karen, the owner of the Charity. 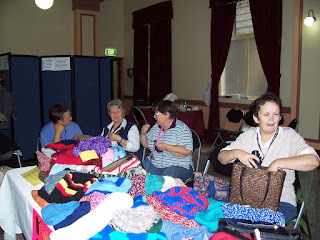 Knitting for Brisbanes Needy was started as a Yahoo online group in January 2006, after hearing from several not for profit charities that they were always desperate for warm clothing, blankets etc for winter for the needy. There were only 2 members for a few weeks but membership started growing and in September 2007 we now have over 140 online members and about 20 off line members, of all ages, gender and locations throughout Australia and overseas. Before donating any items to the lesser known charities that assist the homeless, needy etc we ensure they will be giving the donations directly to those in need and not sell them. To date over 2600 beanies, scarves, mittens, blankets, premature baby clothes, baby/children clothes, toys, animal blankets etc have been donated to many charities throughout Queensland. These include People's Mission (now Student Care Welfare), QUINH, Brisbane Youth Services, Drug Arm, Mater Mother's Neo Natal Unit, Bethesda Nursing Home, Eden in Glasshouse Nursing Home, Sunshine Coast Animal Shelter, Caboolture Fire and Ambulance stations, to name a few. We have been told how appreciative the needy are to receive not only warm clothing/blankets, but the fact that they are brand new, giving them a lift in their self esteem to think someone would hand make something just for them..
All members use their own money to buy wool; needles, postal costs etc and many are on limited incomes. However, thanks to www.girl.com and www.femail.com we were fortunate enough to win a $5000 grant, which will enable us to purchase wool, needles, postal satchels etc to send to members, so that they will now be able to make even more items for the needy. Not only are we grateful for the opportunity to enter the cash grant competition, but the organizations that assist the needy and the needy themselves will also be very appreciative. The shopping spree was amazing - and we have plenty of money left for the rest of our year! Poor Karen - her house is AWASH with yarn - bags and bags and boxes and boxes of it. Also pre-paid postage satchels for posting your donations to her - all members can apply to Karen for yarn for donating to the needy . And you do NOT have to live in Brisbane - anywhere in Australia will be fine - and we have people who knit and crochet for us in lots of other countries too! Well done and a huge thank you to everyone who helped to win us the money. Thanks so much for posting on my blog about joining up for knitting for the needy. You have convinced me! Sooooo happy that your group won Yvette! I think my fingers are finally recovered from all my voting! LOL! Listen, if Karen needs any help stashing the stash, I'd be happy to take it off her hands! LOL! Just kidding there! A job well done and deserved to all you lovely ladies on the other side of the world!